MySQL is a database management system (DBMS), dual license (one being a free software), initially designed to work with small and medium applications, but today given the large applications and with more advantages than their competitors. Has all the features that a large database needs, being recognized by some entities such as the open source database with the greatest potential to compete with similar closed source programs, such as SQL Server and Oracle. By the way, has already guaranteed presence within large organizations, one of the best known is NASA which uses it in an internal routine processing. Graphical Interfaces (MySQL Toolkit) easy to use. The strong point is the integration with other platforms and, when it comes to PHP language, that item becomes even more evident. Projects in PHP that use MySQL database tend to cost much less as both are free and have a wide documentation for support. In addition, the security and integrity of data in projects like that end up causing them to be used in demands of any complexity. Thanks to the ease in joining, the connection of the application with the Bank tends to be very simple, but it’s important to pay attention to issues related mainly to access data. So, count on a tool that can assist in this regard is essential. 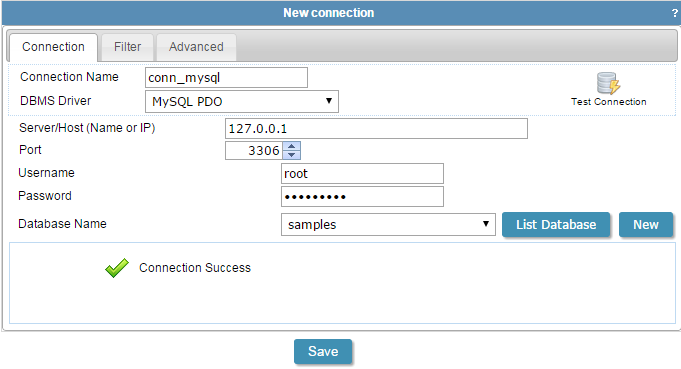 There are many advantages to use MySQL database for projects in PHP. Both being used in the same project represent low cost of development, maintenance and hosting without interfering in the quality of the application being developed. MySQL already has guaranteed presence inside large organizations, one of the best known is that NASA uses in processing routine items inside the organization. One of the greatest strengths is the integration of MySQL and PHP this item becomes even more evident. Projects in PHP with MySQL database tend to cost much less since both are free and have extensive documentation, in addition, the security and integrity of data in such projects end up causing them to be used in projects of any complexity. Server/Host (Name or IP): The physical address from the database, it may be local on your machine, on your local network or remote in the cloud. Database Name: List with all databases available in that connection. Scriptcase support stored procedures and all SQL statements (joins, order by, group by, among others) of MySQL, why lose time when you have Scriptcase to help you out?! Download it now and test it free for 20 days!